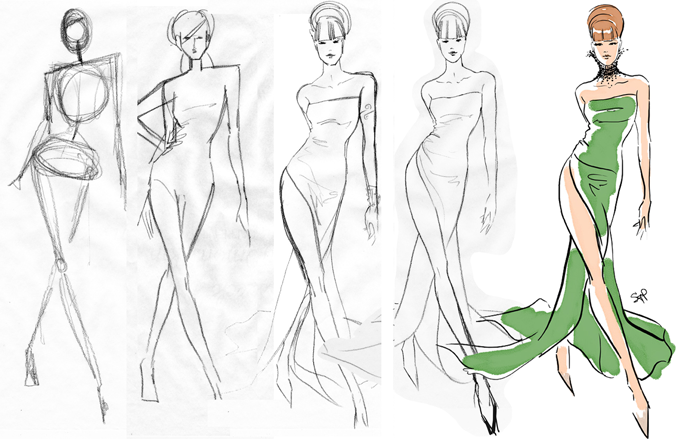 From Stick Figure to Fashion Illustration! People jokingly tell me, ” I can only draw stick figures!” Well, that’s exactly how I start the process of creating some of my fashion illustrations! Although I will often use photo reference for poses , it’s good to use one’s imagination and draw from what I know. First, what am I drawing? A gown or a suit? Jeans or a cocktail dress? What look and attitude am I going for? I’ve decided she’s strutting down the red carpet…so I start with that stick figure – getting the stance and proportions down the way I want. Proportions on a fashion are usually 8-11 heads high so she has really long legs! I draw with a B Turquoise pencil on tracing paper so i can layer pages on top of each other and refine the sketch with each new layer. In the 2nd image I thought I might put one hand on her hip, then changed my mind. In the 3rd I’m really refining details like hair, features and correcting anatomy, especially the hip. Finally, I create a clean final sketch and scan it in so I can complete the final “inked” illustration in Photoshop. I will often just play with several stick figures in poses on paper and see which one captures my attention for a finished sketch. I usually save my sketches, you never know when you might need them. This is just one of the methods I use for fashion illustration!